Johnson & Johnson's (J&J) subsidiary Ethicon has introduced new Enseal X1 large jaw tissue sealer for use in open procedures such as colectomies and hysterectomies. Claimed to be the first in a new generation of Enseal devices, the large jaw tissue sealer can be used in open general, gynecologic, urologic, thoracic, and vascular procedures. The new device’s larger distal electrode surface area is supported by the Ethicon generator with adaptive tissue technology, which allows to effectively reduce bleeding in thick tissue compared against LigaSure Impact. Enseal X1’s 360° shaft rotation enables to improve access to targeted tissue. It also provides separate seal and cut functionally and convenient control placement for less hand movement. According to the company, the Enseal X1 large jaw is compatible with the existing Ethicon GEN11 Generator. It can also used to replace other products or use as an alternative to existing Ethicon advanced bipolar devices. In February, Ethicon agreed to acquire medical devices maker Torax Medical for an undisclosed sum. Torax Medical produces and markets Linx reflux management system and Fenix continence restoration system. 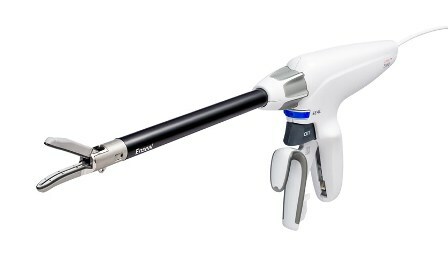 Image: Ethicon’s new Enseal X1 large jaw tissue sealer. Photo: courtesy of PRNewsFoto/Ethicon.